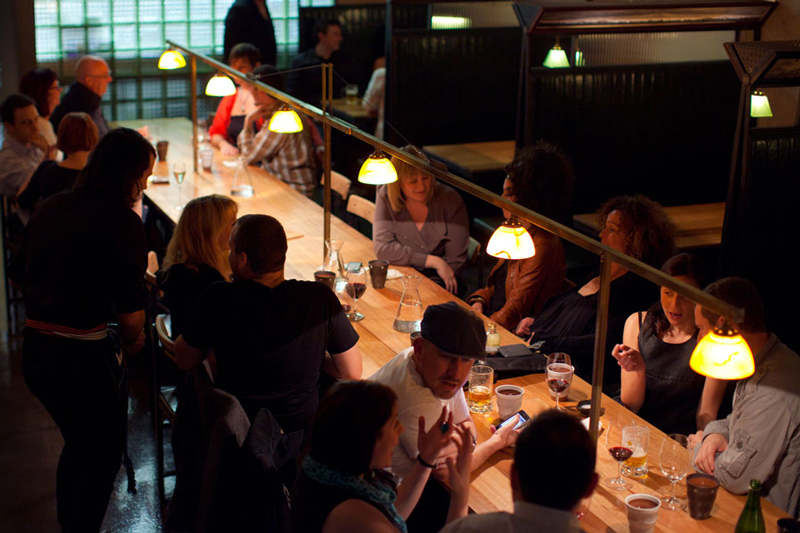 An izakaya is not just a restaurant or bar: an izakaya is a place where eating and drinking take equal parts. But it is more than this: it’s a meeting place, somewhere to bond and forget the worries of the day. Izakayas started as local eating places, where people would go after work to have a couple of drinks and stay for an hour or 10. 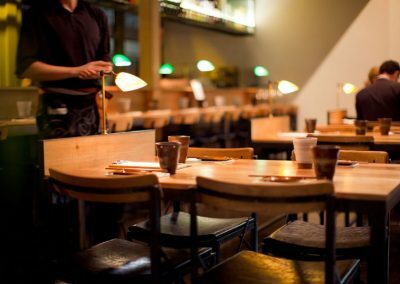 In Japan, izakayas are known for their ‘homeliness’ – everyone knows your name and you are welcome whether you are alone or with friends. 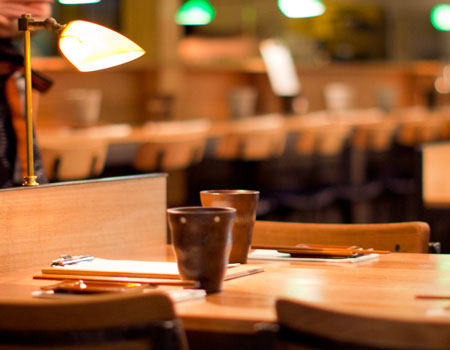 Izakayas have a great range of small and large dishes ordered as-you-like-it as the night unfolds. You don’t have to choose between sashimi, deep fried, meat, vegetarian or other copious choices of food with beer, sake or other drinks – just have a bit of everything and share. 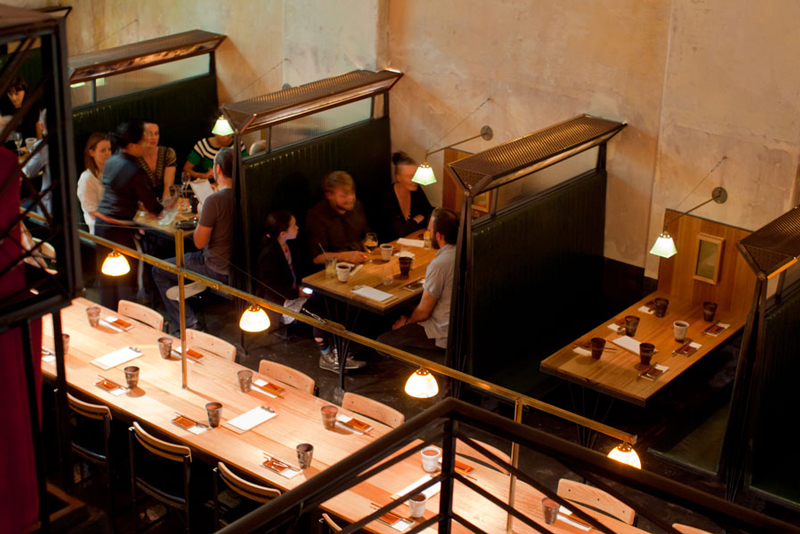 Izakayas are the perfect blend of bar and food. “Kumo’ means ‘cloud’ in Japanese. It also means ‘spider’. The swirly spirals of our logo come from scientific diagrams of cloud movement. 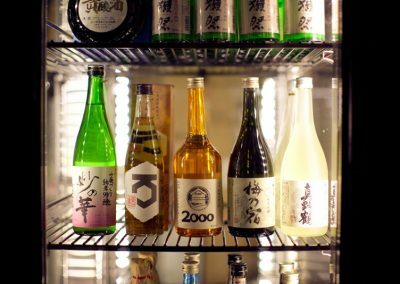 With twenty years of experience promoting sake and Japanese beverages, Kumo owner, Andre Bishop is recognised as Australia’s leading authority on sake and enjoys sharing his passion for sake with the vision to encourage more Australians to discover the joys of sake and Japanese culture in general. 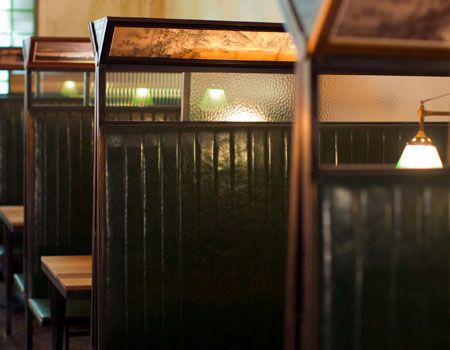 In 2005 Andre co-opened Golden Monkey, a distinguished cocktail bar in the heart of Melbourne’s Hardware lane dinning precinct. 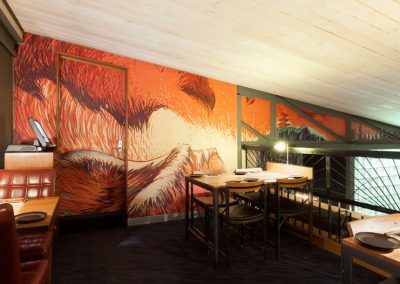 Within its first year Golden Monkey set the standard for modern bars in Australia and in 2006 was awarded “Best New Bar in Australia” by the Australian Bar industry advocate Bartender Magazine. In 2007 Golden Monkey was recognized for its continued outstanding achievements and was honored with winning “Best Bar in Australia”. 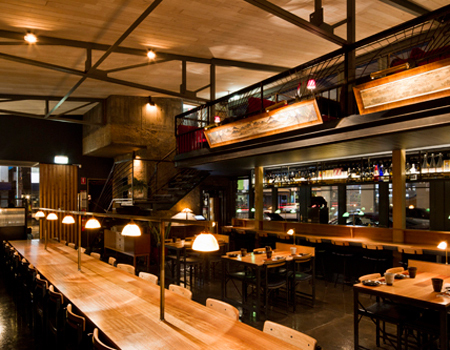 In 2009 Golden Monkey was awarded “Best Bar in Australia” a second time. 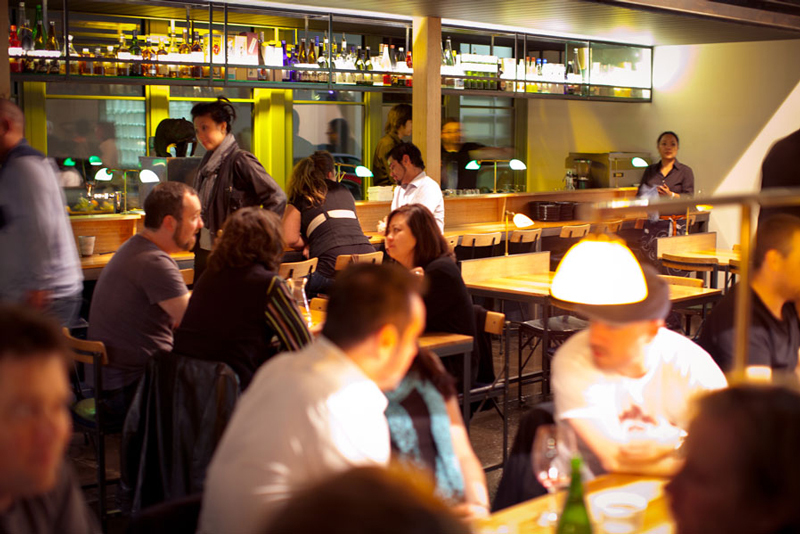 Andre also saved Melbourne’s Japanese dinning institution Izakaya Chuji from closure. The first site, opening in 1989 now has a 29 year history. Andre acquired the original Lonsdale Street location in 2003 and opened up a second store in South Melbourne in 2008. Drawing from his study of sake in Tokyo, Japan, Andre is currently holds a Level 2 Sake Professional Certification awarded by the Sake Education Council in Tokyo, Japan. Andre regularly travels to Japan and has visited many sake breweries to improve his understanding of sake and its production. Acknowledged as an expert in Japanese culture and dining Andre Bishop has run sold-out Sake Events at the Melbourne International Food & Wine Festival to since 2010. Andre is the Sake Ambassador for Australia’s biggest online Sake retailer www.sakeonline.com.auand regularly writes sake reviews, sake education articles and brewery visit reviews. In 2014 Andre was made an honorary Visit Kyoto Ambassador by the Kyoto Prefecture Government. 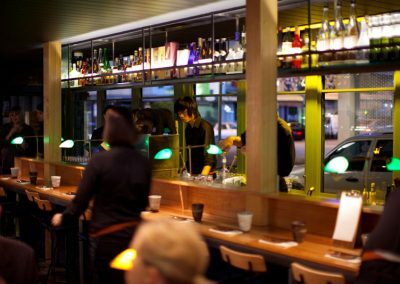 Having moved from Seoul to Melbourne in 2009, Seung worked in a number of top restaurants before stepping into the head chef position at Kumo Izakaya in 2016. He refined his Japanese cuisine knowledge and skills at Komeyui, and further enhanced his art under the guidance of top chef Martin Horsley at no35 Sofitel. 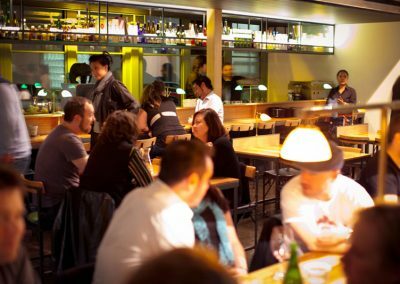 Trained to blend European and modern Australian cuisine to delight the diner, Seung now uses his skill and passion to create a unique and eclectic experience of Japanese and Korean dishes. 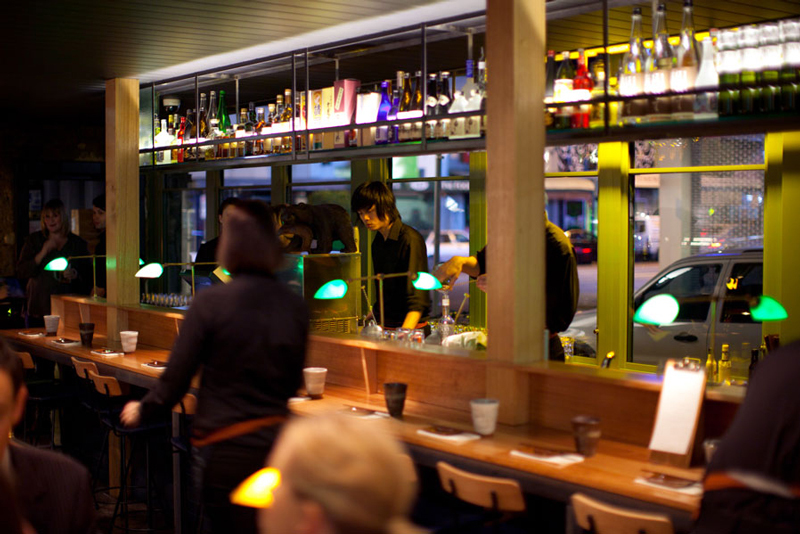 Kumo Izakaya and Sake Bar stands proud at the corner of Lygon and O’Connor streets in Brunswick East. The building is iconic to the area and was constructed in 1956 – we know this because the bricks are marked with Olympic rings in recognition of the Melbourne Olympics. It was originally a bank – it took us two days to cut through the vault to make our sake store! 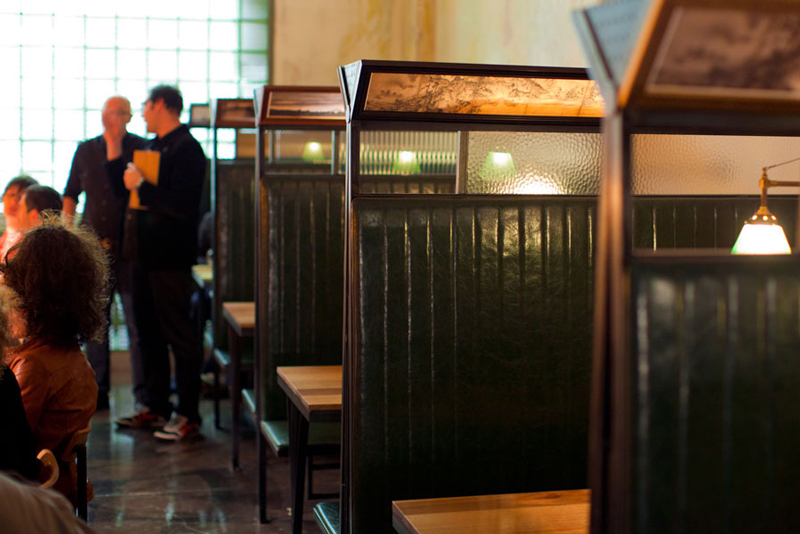 This old bank was transformed into Kumo Izakaya by Richie Built Designer Builders who worked in collaboration with architect Victor Isobe (from Zen Design, known in Melbourne for Yu-U, Heirloom and Tempura Hajime). The eclectic Japanese design style seamlessy blends industrial and Art Deco influences. 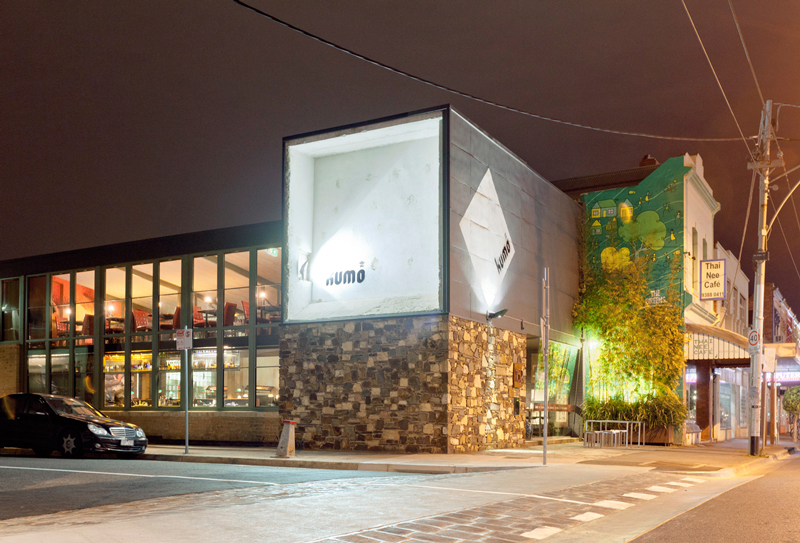 Every detail of the design at Kumo has been considered and reconsidered in an meticulous process of finding a whimsical yet true balance. On the one hand the beautiful bones of the historic building, which reflect the Japanese notes of its natural materials (stone, wood, concrete, steel and glass). On the other its simple, modernist proportions, which reveal the natural synergy between industrial Japanese and Art Deco style. As the design evolved, we were inspired by the influence of Japanese art, primarily ukiyo-e woodblock prints on modernist architects (most notably Frank Lloyd Wright). The wood block prints that first arrived in Europe in the late 1880s were the seed of Art Nouveau – the new aesthetic that distinguished itself away from frilly Victorian detail and realism and towards flowing, natural, botanically-inspired shapes and simple flat 2D geometry. We saw the ‘borrowed’ patterns and shapes taken Japanese design and widely copied within Art Nouveau, then Art Deco, an extension of Art Nouveau that simplified it and moved toward a more machine-oriented and streamlined industrial aesthetic. 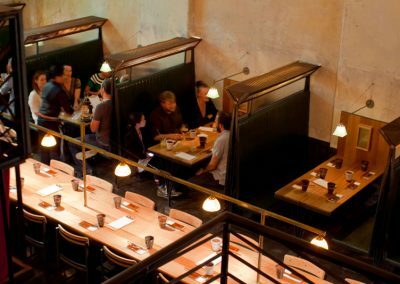 You’ll find many recycled ‘found objects’ from the original 1956 decor as well as great use of recycled Victorian Ash and Tassie Oak (in particular the eight metre communal table, which seats 26, and the 15 metre bar, seating 18). 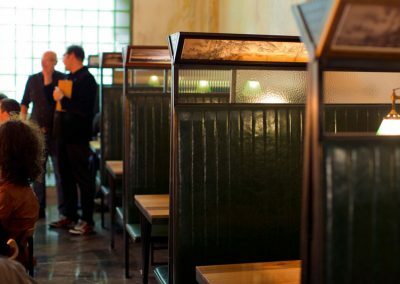 You’ll also find 1930s inspired, custom made bar stools and chairs (modelled on a traditional machinist’s chair) with hand-crafted iron frames, and dusky dark green and blue leather seats. Special care has been taken to source hand-painted lamp shades reminiscent of those found in the State Library Reading Room – which create pools of light that welcome intimate conversation. 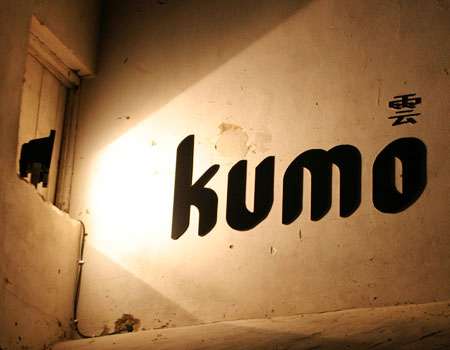 Many details have been hand made by local craftspeople and artisan builders, so we’re extremely proud of Kumo. 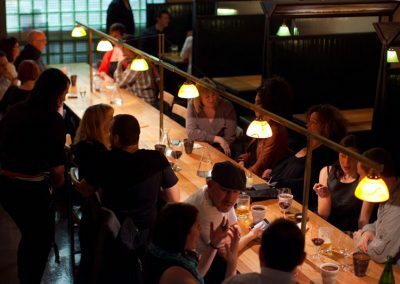 Whether your’re at the bar, the communal table, or huddled in a booth, there’s something for everyone – including a 10-seater tatami room for private dining. 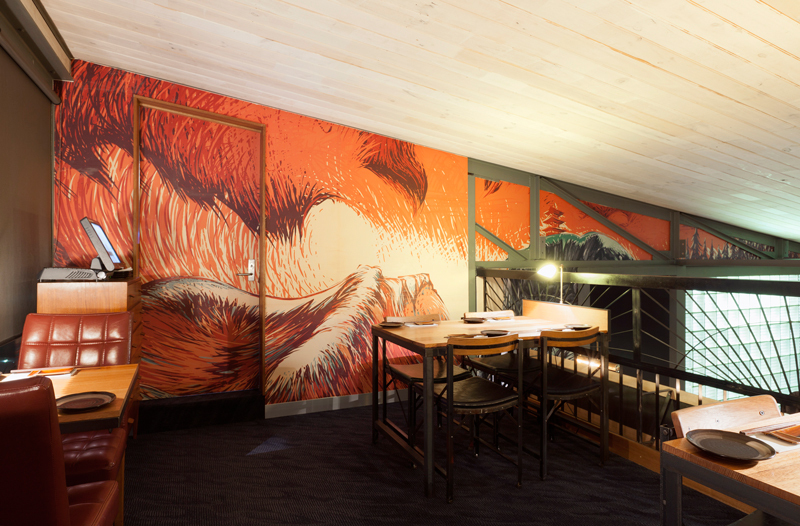 Kumo founder and co-owner Andre Bishop is one of Melbourne’s quiet achievers in hospitality. 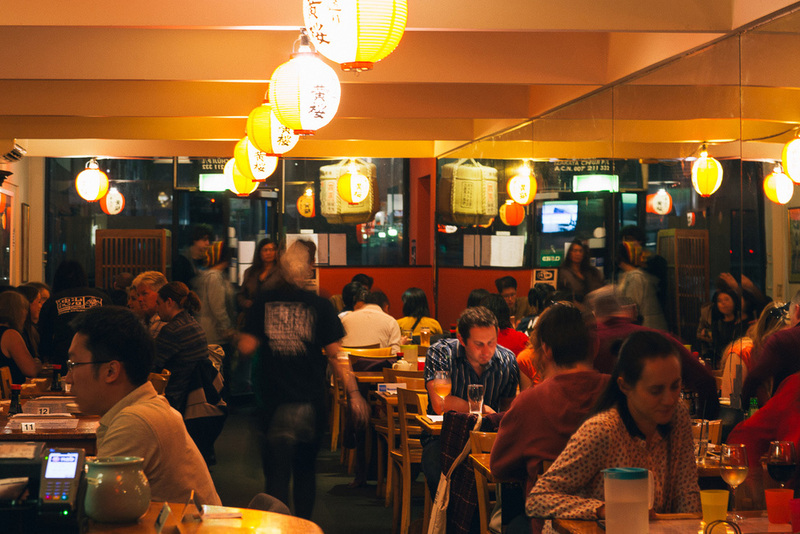 He’s the man behind the revitalisation of Japanese institution Izakaya Chuji, on Lonsdale Street In Melbourne. 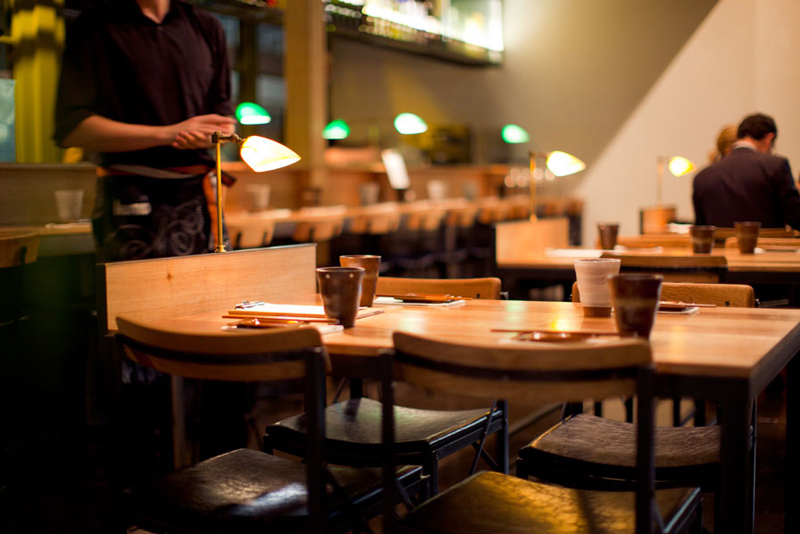 He also created Izakaya Chuji’s South Melbourne offshoot. 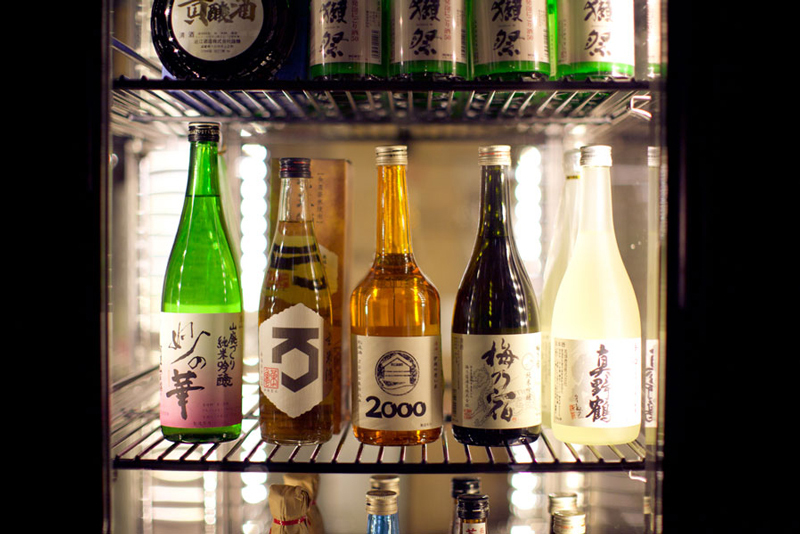 Andre is also behind Nihonshu Sake & Shochu Bar in Melbourne’s CBD. Other venues that have seen Andre’s touch are the pioneering Japanese pop culture Robot Bar as well as the multi-award winning Golden Monkey (inspired by the 1920s opium dens and bars of Shanghai).